According to this website, a Leyland 1 ton petrol van of the LD series cost £694, a 1.5 ton petrol van £728, a 1 ton diesel van £799 and a 1.5 ton diesel van £833 in 1959. Edit: According to this video, the Boeing 307 Stratoliner had an engine change and complete inspection every 550 hours of flying. In preparation for the passenger and mail classes feature, currently in progress on the passenger-and-mail-classes branch on Github, I am working on gathering together some information on the relative costs of different classes of passenger travel and postage. This has not been very easy to find in some cases, but I do my best to reproduce what I have here. Firstly, rail fares from 1844 onwards until nationalisation in 1948 for third class passengers had to be charged at no more than 1d/mile. The actual rates that they charged, so far as I can find, varied considerably. What I need to try to find is a ratio between first and third class fares (and likewise second class fares). This article refers to prices on the Stockton and Darlington Railway in 1825 - passengers were initially conveyed on the whole 19km route for 1s (12d). The following year, passengers were allowed to travel in uncovered wagons for 9d. The passengers in the covered carriages thus paid 1.33x the price of the passengers in the uncovered wagons. This website gives historical prices for travel on the Bournmouth Belle in the 1950s, with 3s 6d first class and 2s third class, the ratio of first to third in this instance being 1.7x. This forum gives the prices of 7 day all lines rover tickets in 2009, being £650 for standard class and £990 for first class, giving a ratio of 1.52 first to standard class. 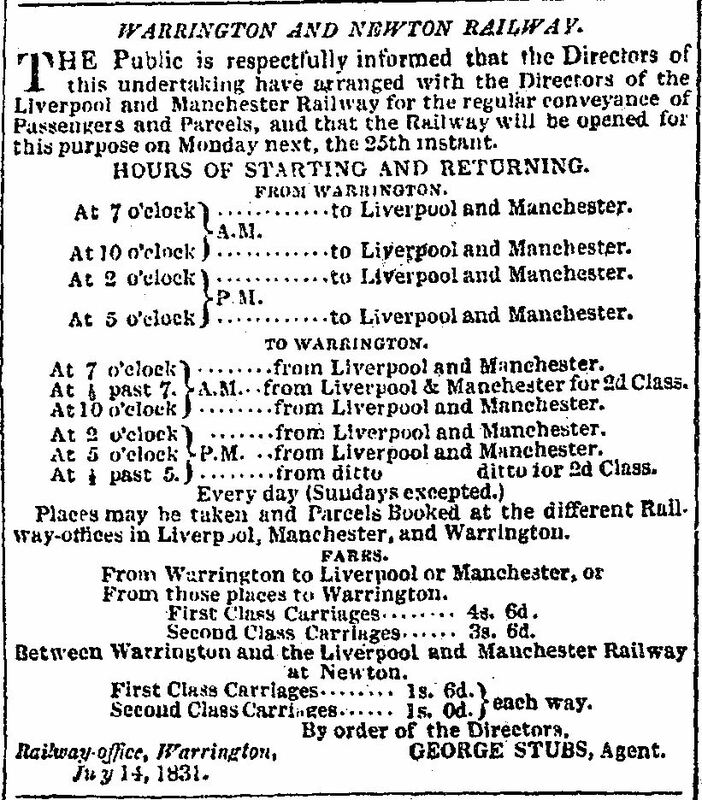 The above poster gives fares for an extension of the Liverpool and Manchester Railway to Warrington in 1831. Between Warrington and Newton, the fare is given as 1s 6d for first class and 1s for second class, giving a ratio of 1.5 first to second class. Between Warrington and Liverpool or Manchester, the first class fare is 4s 6d, and the second class fare is 3s 6d, giving a first to second class ratio of 1.285 (an unusually low ratio and curiously different to the Newton to Warrington fares). That is all of the historical information that I have easily been able to find. Contemporary information is, of course, easier. Classes are regularly used in rail and air travel. The National Rail Enquiries website gives the price of a standard class (flexible) London to York ticket to-morrow evening as £122 and a first class ticket as £200, giving a first to standard class ratio of 1.63. From Edinburgh to Glasgow, the fare is £8.80 standard class or £13.40 first class, giving a 1.522 first to standard ratio. From London to Bristol, the standard class fare is £102 and the first class fare £176.50, giving a first to standard class ratio of 1.73. From London to Manchester, the standard class fare is £169 and the first class fare £242, giving a first to standard ratio of 1.43x. From Leeds to Liverpool, the standard class fare is £32.10 and the first class fare £41.30, giving a first to standard ratio of 1.28. From London to Brighton, the standard class fare is £27.80 and the first class fare £41.70, giving a first to standard ratio of 1.5. For my sample of contemporary (2017) peak time weekday rail fares, therefore, the standard class to first class ratio goes between 1.28 to 1.73, with a mean average of 1.515. Skyscanner gives a good impression of contemporary air fares. For a shorter haul flight, from London Heathrow to Frankfurt Main, economy class fares start at £270, premium economy is not available, business class starts at £578 and first class is also not available. This gives a ratio of 2.14 business to economy. This website gives a good comparison between 'bus and Underground fares in London. The ratios vary from 0.35 in 2004 to 0.4 in 2007 to 0.38 in 2016. In some ways, mail is more straightforward. Contemporary information from the Post Office can be found here and here. A first class stamp currently costs £0.65 and a second class stamp costs £0.56, giving a first to second class ratio of 1.16. According to historical data from this article in The Guardian newspaper, in 1980, a first class stamp cost £0.12 and a second class stamp £0.10, giving a first to second class ratio of 1.2, which seems therefore to have stayed constant for a number of decades. Special delivery, meanwhile, costs £6.45, giving a ratio of 11.51 compared to second class post. Edit: Speaking to my father, who is a stamp collector, he tells me that early air mail cost about 2.4 times the cost of surface mail. Special delivery is probably not a sensible comparison, as this involves payment for an additional feature (the "signed for" service) beyond transport that is not simulated in Simutrans. The plan is to have 5 passenger classes and perhaps 3 mail classes. It seems evident that some of the rail fares above for passengers, although nominally of the same class, are likely to be targeting different markets with different levels of income. * This should be set to be equivalent to 1d/mile in 1900, and inflation adjusted for other years. Some very interesting calculations suggest a heartening degree of long-term consistency in these prices. If we imagine paying an inflation adjusted 1d/mile from London to New York, we find that this is surprisingly close to the modern economy class air fare. So, New York is 3,470 miles, which would be 3,470d. Each old penny is 1/240th of a pound, so that would work out as £14.46 in the decimalised equivalent in 1900 figures. Adjusting this for inflation using the CPI from this website, we get £1,674.45, which is very close to the current premium economy fare, and 1.33 above the economy fare. From New York to the original city of York, that distance is 174 miles from London. 174 / 240 = 0.725, giving £83.38 in 2017 terms, cheaper than the peak time standard class fare (which is 1.46 times higher than it), but more in line with the advance purchase standard class fare of £64.00 (and applying the suggested 0.6 ratio for very low/4th class above produces the figure of £50.03, which is very similar to the lowest possible fare of £53.00 travelling with an advance booking at an earlier time. These figures, taking a simple pence per mile approach, also suggests that passengers are not likely much to benefit from the fare stages system (at least, for long journeys) that is rather more important for goods. Having been away in Cornwall for a day or two, I have not had a chance to work on the coding, but, on the train back, as I am now, I have been able to do a small amount of research into how vehicle maintenance costs vary over time, which will be useful for calibrating the forthcoming maintenance features discussed in another thread. Firstly, aircraft. This document by the RAND Corporation gives a very interesting insight into how aircraft maintenance costs increase over time. This is done by time, it should be noted, not distance, so this might be somewhat hard to calibrate. It normalised a 6 year old aircraft's maintenance costs at 1.0, and found that a new aircraft's maintenance cost was 0.4, at 12 years maintenance was 1.2, and that it increased only insignificantly (0.7% per year) after that. Meanwhile, this set of PowerPoint slides from 2007 shows the relationship between fuel costs, parts costs, maintenance labour costs, driver costs and other costs for running 'buses, which, while not giving any indication of the variable maintenance costs with time, does at least give a good idea of which parts of the costs should be varied (parts, maintenance) and which proportion should not be (drivers, fuel). It gives fuel as 13% of cost, drivers as just under 40%, parts as 5%, maintenance staff as 6.3%, oveheads as 12%, pensions as 3.8% (this is a poor category, as the costs of these should be distributed among the differnet staff categories), staff on costs as 4.3% (ditto), and administrative staff as 6.5%. Here is an article about how car maintenance costs increase with mileage. This might be able to be extrapolated to other categories of road vehicle, particularly light vans. It finds that, from 0 - 25k miles, the maintenance costs are US$1.4k; from 25-50k miles, the costs are US$2.2k, from 50-75k miles, costs are US$3k, from 75-100k miles, costs are US$3.9k, from 100-125k miles, costs are US$4.1k, from 125-150k miles, costs are US$4.4k, from 150-175k miles, costs are US$4.8k and from 175-200k miles, costs are US$5k. As with aircraft, the effect seems to flatten with time but continue to increase gradually. Edit: According to a .pdf which I have downloaded but the link to which I cannot currently find, entitled, "Advanced Clean Transit Program - Literature Review on Bus Transit Maintenance Cost", the maintenance costs of hybrid 'buses start at about US$1.50/mile, increasing to US$2.00/mile at 10 years of age, US$2.50/mile at 15 years of age and about US$2.70/mile at 20 years, whereas diesel 'buses start at US$1.70/mile, increase to about US$2.20/mile at 10 years, US$2.30/mile at 15 years, and US$2.60/mile at 20 years. This suggest an interesting property of these maintenance cost increases, being that the increases are greater in vehicles with more modern technology. It is interesting to note in this connexion that steam locomotives, especially those used for lower speed, shorter distance work, could sometimes stay in service for over 70 years, and there was at least one example of a pair of steam locomotives built by the London & South Western Railway that were in regular service for nearly 100 years before they were withdrawn when steam traction generally was replaced on British Railways. This suggests that the increase in cost from the base line should be capped based on a setting in the individual vehicles' .dat files, and this cap, as a proportion of the total amount, should be higher in the case of more sophisticated vehicles and lower in the case of less sophisticated vehicles. According to a post here https://groups.google.com/forum/m/#!msg/uk.railway/Dec6ff14wUg/UCUSQoisVGMJ the Deltic locomotives had a planned availability percentage of 77% in the 1970s. Some information on the prices of railway carriages from, "Great Western coaches from 1890" by Michael Harris, published by Thomas & Lochar, ISBN 0-946537-82-8. According to Harris at p. 17, he reports GWR four wheel carriages to have cost £380 - £450 in the middle and late 1890s, while clerestory corridor stock of the same period cost between £1,000 - £1,200 (all per carriage). The first restaurant cars, of 1892, cost £2,130 each; the 1903 cars £1,770 each. On p. 18, he notes that the standard 57ft "Toplight" carriages cost £1,200 each for those panelled in wood, whilst the steel panelled versions cost £1,500 each. The "Toplight" restaurant cars cost between £2,000 and £2,300 each. On page 41, he reports that GWR non-corridor third class bogie carriages of 46'6" length cost £730 each in 1894, rising to £847 for very similar (but I think somewhat developed) carriages in 1902 when they were superseded by a later type. An interesting note on dining car revenue is given on page 50: during the last half of 1890, the LNWR conveyed 8,784 dining passengers (an average of 14 dining passengers per journey), total gross receipts from the dining car service being £2,787 (or £0.31 per passenger in decimal currency). The costs are given as £2,817, showing the LNWR dining service to have been making a modest loss at the time (albeit not taking into account the extent to which such a service attracted more travelling passengers in the first place). On the same page, he reports the cost of the 56ft dining cars of 1896 cost £2,138 each, and the staff costs (one cook, one attendant and one "page") were estimated at £195 per annum between them. At page 52, he reports that the later 56ft dining cars of 1902/3 cost only £1,770 apiece. At page 56, Harris states that the steam rail motors produced from 1903 cost £1,738, of which cost £1,100 was for the traction equipment (steam engine, boiler, etc.) and the remainder was the carriage itself. Some interesting information regarding costs/prices associated with small ferries from, "The London Tilbury & Southend Railway, volume 6: the Gravesend ferry" by Peter Kay (ISBN 978-1899890507) follows. A steamboat of unknown description (I infer secondhand) was purchased for the ferry in 1852 for £626. A new horse boat was purchased in the same year for £240. This was a sailing boat, described as, "clinker built, copper fastened, with mast sails anchor and about 15 fathoms of chain, and stage abaft with tackle complete" (p. 433). In March 1956, tenders were obtained for two 170ft diesel boats (capable of carrying cars) to replace the existing steam boats, the cheapest bid for which was £182,743 each (p. 450). In 1958, tenders for smaller, passenger only boats were raised, and the bid for those were £80,000 each (p. 450). In around the 1970s, the annual cost of maintaining what is described as the "BR portion of the Tilbury landing stage" was £40,000 (p. 452). In 1860, one of the early steam boats on the Gravesend ferry, "Sir Walter Raleigh", which was originally an entirely open boat, had its aft deck enclosed at a cost of £500 (p. 485). The same boat then underwent repairs (effectively an overhaul) in March 1879 at a cost of £2,840 (p. 486). In 1859, a new steamboat, with a fully enclosed aft cabin and a lower fore cabin, the "Earl of Essex", was purchased for £4,154, and was overhauled in 1877 with new boilers and other repairs for £1,100 (p. 486). A further new boiler was fitted in 1891 and it was scrapped in 1906 (ibid). In 1882, a more modern ship (albeit still a paddlesteamer, but this time built of steel rather than iron) was purchased for £7,550, the vessel being delivered the following year (p. 488). Its name was "Tilbury", and it carried 600 passengers at 8 knots (ibid). In 1892, a screw steamboat, "Carlotta", was purchased for £6,585, with a speed of 10 knots and a capacity of 626 (p. 489). In 1903, a further new screw steamboat, "Catherine", was purchased for £8,275, this time with a capacity of 648 passengers and a speed of 9 knots (p. 491). In 1905, a new boat, "Gertrude", was purchased for £8,700 - this had an open foredeck and could thus accommodate livestock and motor vehicles (p. 494). It had a 699 passenger capacity and a speed of 9 knots. In 1912, a further boat, "Edith", was purchased for £11,234, with a capacity of 850 passengers and a speed of 9 knots (p. 495). In 1923, the first dedicated car ferry for the service, "Tessa", was purchased for £13,800. This had capacity for 30 cars and 250 passengers and a speed of 9 knots (p. 498). A similar but larger ferry, "Mimie", was purchased in 1927 for £17,825 with capacity for 36 cars and 300 passengers (p. 499). This website has useful information about wages in the 1700s - thanks to Dutchman on Rails for the link to that. Edit: Some information that I had not previously uploaded here from a book that I read earlier this year, entitled, "Ian Allan Transport Library - Daimler". * A single decker Daimler COG5 with a 32 seat body (although this source suggests that the vehicles in question in fact had 34 seat bodies) was reported as giving between 11.79 and 12.55mpg on what are described as "local services" (caption for lower picture, page 42). This suggests that single decker 'buses with their lower weight had significantly better per vehicle (if not necessarily per passenger) fuel economy compared to double deckers, the mileage of which is given above. * At page 71, it is suggested that the 6 cylinder Gardner engines of the COG/CWG/CVG6 series had a "longer life" than the 5 cylinder engines of the COG/CWG/CVG5, although specifics are not given. - a silver topped stick on retirement (date not given). * This downgrade is reported to have been following the collision of a goods train, for which my great, great grandfather was docked a week's wages, although apparently he was not to blame. This Youtube video gives updated wages for 1946 - a signalman could expect to earn between £4-£6 per week (for an 8 hour shift) depending on the size of the signalbox, large junction boxes commanding the £6/week wage. Those working at a control centre earned "anything up to £8 per week and a good pension at the end". People in marshalling yards earned "up to £5 per week". There was a maintenance gang for every 2 miles (3.2km) of track "on average". The maintenance gang in the film was depicted as having five people in it. The platelayers earned the railway's minimum wage at the time, which was £4-4s per week. Those working in a locomotive depot (even the locomotive cleaners) earned "a little more" than this. A parcels porter (a more senior position than an ordinary porter) earned £4-10s per week. Booking office clerks earned "as much as £7 per week" (suggesting that there were different grades of booking clerk of which the highest were paid £7 per week). Some useful information on the prices of locomotives and rolling stock of the Metropolitan District Railway in London before electrification from this source. The original locomotives were all but identical to the Metropolitan Railway "A" class, and cost £2,280 each in 1871. The second batch with "minor modifications" cost £2,265 each in 1875. A further order in 1883 cost £2,286 each. In 1906, shortly after electrification, 43 steam locomotives were scrapped, going to different scrapyards, and fetching between £310 and £316 in scrap value. In 1909, a further 4 locomotives went for scrap at £240 each. The initial rolling stock consisted of carriages based closely on those of the London, Chatham & Dover Railway (with internal modifications to increase capacity). The trains consisted of 2 first class carriages (each costing £455), 2 second class carriages (£373 each) and 4 third class carriages (£332 each). Some all-inclusive prices are given in the article for "block trains" in the 1880s, but are not reproduced here as it is not clear how this relates to the prices of each individual vehicle. New carriages were built in 1900 relating to the joint working with the London, Tilbury & Southend Railway. Dimensions of the individual carriages to this design are given as 26ft 4 3/4" length over body, 8ft 6" width, 11ft 8" height from rail to lamp tops, and a 14ft 0" wheelbase. First class carriages (to the 1900 design) seated 40 each (four compartments of 10 each), while second and third class carriages seated 50 each. Second class luggage compartment carriages seated 40, and third class luggage compartment carriages 30. Third class carriages were apparently fitted with cushioned seats. Carriages were braked on the Westinghouse principle. In 1905, two third class carriages were sold to the War Office for a second-hand price of £50 each. In 1906, 40 carriages were sold to the Taff Vale Railway for £30 each. According to this web page, the Morris LD van (1.5 ton version) cost £758 with a petrol engine or £877 with a diesel engine including purchase tax in 1956, having fallen by 1959 to £728 and £833 respectively (the reduction being caused by the abolition of purchase tax on commercial vehicles). According to this very old edition of the Encyclopedia Britannica, the Killingworth colliery engines (probably Stephenson's Improved Engine of 1816) burnt 50lb of coal per mile at 6 miles per hour (being 8.33lb of coal per hour). According to this website, in circa 1810, wooden waggonways were recorded as costing 5s per yard. Edit: According to this old book, a steam locomotive built in 1831 for teh Monlkand and Kirkintilloch Railway, based on the design for "Locomotion", but with a multi-tubular boiler, cost "about £750" new (p. 51). The same book at p. 53 records that the "Wilberforce" 0-6-0 locomotive of the Stockton and Darlington Railway, built by Hackworth/Hawthorn in 1832 of the "Majestic" class, consumed 68lb of coal per mile, could haul 36 loaded chaldron wagons (equal to 171 tons) "on certain favourable gradients", and cost 4.5d per mile for repairs in 1839. It is recorded as having hauled 635,522 ton miles in 1839, in which year the combined wages of its drivers and firemen were £352-12-8. (3) fully open third class carriages (possibly without seats): £143. Edit: Page 43 of that same work refers to the price of the Midland Railway's 1844 copies of the original Grand Junction Railway's 1838 "flying post office" as being £460 each, built by outside contractors. According to the 1989 edition of the Great Eastern Railway Society Journal special (no. 3, summer 1989), available for download (albeit for a small fee) on the Great Eastern Society website, the service life of railway carriages built in the 1850s was in the region of 20 years. Edit: The following information is taken from "Highland Railway carriages and wagons" by Peter Tatlow, published by Noodle Books (ISBN978-1-909-328-13-6). By 1902, the Lochgorm works employed 700 people (p. 10). By 1930, after grouping, the works had been reduced to facilities providing only light maintenance, employing merely 163 staff (p. 11). Adding cushions to third class compartments that previously had bare wooden seats cost £2-5-0 (£2.25) per cushion in 1881 (pp. 24-5). The initial carriages for the railway purchased in 1855 cost as follows: three first class carriages: £1,065 (presumably, for all three rather than each); four third class carriages: £800; and one brake van for £215 (p. 27). In 1863, further orders were placed as follows: first class carriages £390 each; composite carriages £322-10 each; third class carriages £216 each; vans: £215 each; guards' brake vans: £144 each; horse boxes: £158 each and carriages trucks £104-10 each (p. 29). In 1873, first class four wheel carriages were built at a cost of £517.5, weighing 9 tons, 10cwt and being 24ft 1in long and 7ft 4 in wide; third class carriages, of the same weight and dimensions, were in that year constructed for £290 apiece. Some similar but longer third class carriages (25ft 1 in length) were built in 1878 by a different builder for only £260.6 each, and the same cost appears to have attended some even longer carriages of 27ft 3in, weighing 10t 10cwt. These later carriages were 7ft 11in wide (p. 34). Four elderly third class carriages were sold to a colliery branch line secondhand in 1898 for £60 each (p. 35). Six wheel tri-composite carriages built in 1879, being 35ft 1in long, weighing 14 tons 10 cwt cost £499 each (p. 38). Some third class carriages were converted to composites in 1909 at a cost of £51-10-0 each (p. 40). Some locker composite carriages were built in 1888 by outside contractors to HR diagram 9 at a cost of £994 each (p. 44). In 1908, some tri-composite lavatory carriages to diagram 15 were fitted with new bogies to improve their riding at a cost of £33 per carriage, and in that year the scrap produced from the old bogies, being 4 tons 4cwt, was sold for 35s (£1.75) per ton (p. 48). A batch of lavatory third class carriages to HR diagram 28 were built by outside contractors in 1893 at a cost of £690 each (p. 50). In circa 1909, some 6 wheel carriages (35ft 8in long, 14 tons tare) were built by outside contractors, the third class examples costing £580 each (p. 59). Luggage composites lit by gas built to HR diagram no. 58 in 1908 cost £690 each and weighed 16 tons 0 cwt. Some coupé composites built the following year, oil lit with the same tare weight, cost £706 each (p. 62). In 1901, some luggage/lavatory composites to HR diagram 17 were built by outside contractors at a cost of £900 each for one contractor and £1,115 each for the other. In 1899, some lavatory thirds to hr diagram 29 were built by various outside contractors for £895, £900, £1,025 and £1,030 each (p. 65). In 1907, carriages to HR diagram 62 weighing 22 tons 0 cwt and of 46ft 4in length were built by outside contractors at a cost of £1,040 each; some carriages in the same year built internally to diagram 63 cost £772 each; and some 50ft 8in long carriages weighing 24 tons 7 cwt were built by outside contractors to HR diagram no. 56 in 1910 at a cost of £1,550 each (p. 77). Bogie corridor carriages built in 1907 by outside contractors to diagram 54 cost £1,700 each (50ft long); similar carriages but 52ft long built to HR diagram no. 55 in 1912 cost between £1,477 and £1,570; composite brake carriages built in 1912 to HR diagram 57 (50ft length) cost £1,275 (outside contractors), and carriages to HR diagram no. 52 built in 1916 by outside contractors (52ft length) cost £1,596-10-0 each (p. 84). Some 50ft bogie corridor third class carriages to HR diagram 60 built by outside contractors between 1909 and 1912 cost between £1,225 and £1,330 (depending on the date of construction); some similar carriages to diagram 61 cost £1,559 in 1917 (p. 95). Some passenger brake vans to diagram 35 were built in 1873 at a cost of £328 each. Orders for two passenger brake vans in 1861 for £126 each are also recorded (p. 98). Those same brake vans were then rebuilt in 1907 with panelled sides for use on short branch lines at a cost of £115 each (this may represent in effect the cost of overhaul) (p. 100). Some 6 wheel passenger brake vans to HR diagram 38 were built in 1900 at a cost of £600 each (p. 106). Bogie passenger brake vans built to diagram 64 between 1904 and 1909 cost between £607 and £670 (both by outside contractors (£645) and the HR itself (£607. £670). Similar vans to diagram 65 built by the HR itself in 1913 cost £800 and 1915 only £720 (p. `08). A post office mail van was acquired in 1858 at a cost of £210, supplied by outside contractors (p. 113). In 1884, new, larger mail vans were built (37ft 9in long) by outside contractors at a cost of £564 each. A further van to the same design was built by the HR itself in 1888 at a cost of £500 (p. 116). In 1878, covered carriage trucks were built by outside contractors at a cost of £170-7-6 each. In 1902, some further, larger, examples were built using reclaimed underframes from old 3rd class "rib sided" carriages, at a cost of £112/116 each (p. 131). In 1881, some 11 ton meat vans were built at a cost of £150 each, plus £5 each for making them suitable for use in passenger trains (p. 133). Further meat vans to a later design were built in 1906 for £160 each. In 1858, open wagons measuring 12ft 10in b 7ft 6in by 1ft 4in internally were purchased at a cost of £65 each. Slightly larger wagons were built in 1861 at a price of £88-17-6 each (p. 145). Covered goods vans were built in 1858 for £96-5-0 each (p. 148). Some wagons of the same type to a later design were built in 1912 at a cost of £120 each (p. 150). 10 ton mineral wagons built in 1880 cost £90 each (p. 151), and 16 ton mineral wagons built in 1903 cost £84 each (p. 153). 8 ton wagons built in 1898 cost £75 each (ibid). In 1908, some 12t wagons were built for £94 each (p. 156). Timber/bolster wagons built in 1855 cost £437 for six (£72.83 each), and in 1863, more of these were supplied by outside contractors for £79-18-6 each (p. 157). Cattle wagons in 1874 were purchased from outside contractors at a cost of £104 each (p. 163). Goods brake vans supplied in 1874 by outside contractors cost £328 each (p. 178). 13 ton goods brake vans of type "C" were built in 1898 at a cost of £197-10-0 each (p. 181). A large, 20t 6 wheel goods brake van design in 1908 was produced, the vehicles costing £308 each (p. 182). Similar vans on steel underframes in 1918 cost £995 each in 1918 (p. 188). According to this website, the first installation of an electric telegraph for railway signalling in the UK was in 1839, and cost £3,270 for the section of line between Paddington and West Drayton on the Great Wester, being 13 miles. This was an early form of telegraph which needed more conductor wires, and was more expensive than later forms of telegraph. Some interesting information on the running cost of modern diesel multiple units: the Wikipedia article for the class 230 (Underground D stock DMU conversions) gives a comparison between the fuel consumption and running cost of these. the class 150 and an unspecified "new DMU" (as at circa 2017). class 230: 0.5l per car mile. class 230: 40p per car mile. The capital costs sadly are expressed as leasing prices, which are of limited use. According to this film, in 1938, the LMS railway used 5.5 million tons of coal per year at a cost of £4m, which would equate to a price per ton of £0.72. According to "GWR Goods Train Working" (volume 1) by Tony Atkins, in 1900, a total of 23 million goods train miles on that railway yielded £5.7m in receipts. In 1912, the figure was 20 million goods train miles and £7.5 million in receipts. Between 1900 and 1908, the average revenue per train mile for goods trains increased from £4-11-8.5 to £6-11-5.6. Goods locomotives were said to have consumed 50lb of coal and 0.07 pints of lubricating oil per freight engine mile compared to 50lb and 0.06 pints for passenger engines. According to the same book at p. 13, average speeds for freight workings in 1923 were between 9.8mph for Chester and Gloucester and 4.2mph for the Cardiff valleys (including starting/stopping at intermediate calling points). For reference, London was 9.5mph, Swansea 5.0mph, Birmingham 7.2mph, central Wales 6.6mph and Exeter 9.7mph. According to a book whose details I forgot to recall relating to the Southern Railway "Schools" class locomotive of 1930, the cost per locomotive was recorded as £5,374 each; they were said to burn 51lb of coal per train mile with a loading of 345 tons and using "Chislet" coal of 14,500BTU. Indicated horsepower was said to be 1,176 at 46mph. According to another book whose details I forgot to record, realting to steam locomotives on the Southern Railway, the Southern Lord Nelson class would burn up to 50lb of coal per mile on the heaviest duties. Some of what you are asking about is covered in David N Clough's excellent book "Hydraulic versus Electric". Building costs per loco for some classes are given. e.g. For comparison the last 9Fs built cost £33497 each.